7 TOYS in ONE - GROWS WITH YOUR CHILD: This is more than just a classical toy with a modern twist on a shape sorter toy. 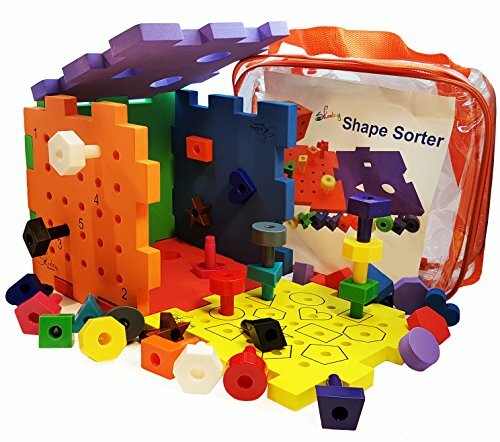 This on-the-go activity center busy box is a Shape Sorter, a Shape Peg Board Set ,a Foam Puzzle Play Mat, a Counting Stacking Mat, a Shape Matching Mat and A Shape recognition Activity. The 6 peg boards early developmental toys are baby and toddler friendly for occupational therapy and fine motor skills games. BABY TOY: THE PEGS ARE OVERSIZED AND CHUNKY FOR LITTLE FINGERS TO GRASP. This pegboard play cube attracts your baby’s attention and ENCOURAGES IMAGINATIVE PLAY. Babies can drop the 24 VIBRANTLY COLORED PEGS into the open cube…or through the shape-sorting puzzle mat sides. Each peg shape fits through a hole of the same shape on the cube for self-correcting Montessori play. An early-learning opportunity for 10 month olds to 1 year old. TODDLER TOY: THE INTERACTIVE CUBE HAS 6 SIDES OF PLAY TO ENCOURAGE DISCOVERY AND EXPLORATION. When your Child is ready for a little more challenge they can move on to sorting and stacking the peg shapes. This is a great time to introduce the basic colors and shapes as they play. This makes it an ideal toys for 2 and 3 year olds as they sort and stack and learn to identify and match shapes and color recognition. The Skoolzy Shape Sorter Pegboard Cube is a fun way for you to extend play. PRESCHOOLER: COUNTING, LEARNING AND IDENTIFYING MORE COMPLEX COLORS AND MATCHING ADVANCED SHAPES There are 12 DIFFERENT SHAPE TYPES AND 12 COLORS to learn as your Child progresses. An illustrated downloadable guide helps identify the names of the shapes—from the simple circle, square and triangle to the more advanced trapezoid, octagon and hexagon. Use the Shapes and Math Counting foam peg boards as counting toys. EASY STORAGE & BEST TRAVELS FOR TODDLERS :The easy-to-carry backpack makes it easy to carry and store the whole set around--even for crawlers, scooters, and emerging walkers. Great as a busy bag take-along toy for holiday travel and doctor visits. -Downloadable parent activity guide for the toddler toys. The Skoolzy Shape Sorter Pegboard Cube grows with your child from baby to preschooler. Babies from 9 month old will enjoy dropping and dumping pegs out of the foam cube. It is noisy and fun – great for early learning skills.